This DVD is part of Roman's Getting the Winning Edge in the Middle Game series. 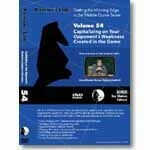 In this volume Roman will help you recognize, exploit and capitalize on your opponents weakness. He will also help you to be able to avoid these mistakes in your own games.